New and convenient morning and after-school times available to fit into your family's schedule. New to swim lessons, try our mini-session, where classes meet multiple days over a two-week period from April 15th-26th. We have also added more days and times to our spring session that begins April 15th and ends June 9th. With the new added days and times below in addition to our current spring schedule found in our spring program guide, pick the best time that fits your family’s needs. Registration for the new added classes will be by age. Swimmers will be placed in appropriate classes on the first day. With new guidance and a reenergized vision, we have upgraded the Swim Lesson program at the West Cook YMCA. Please read the information below to help guide your decision making on which type of lesson best fits your needs. If you have any questions, please feel free to contact us! Swimming is not only a fun, healthy activity, but an important life skill for children and adults. Learning basic water safety and swimming skills is a great introduction to the world of swimming which supports a supports a wide scope of physical and emotional growth. By learning to stay safe in and around water, swimmers can begin to increase their level of comfort in this unique environment. 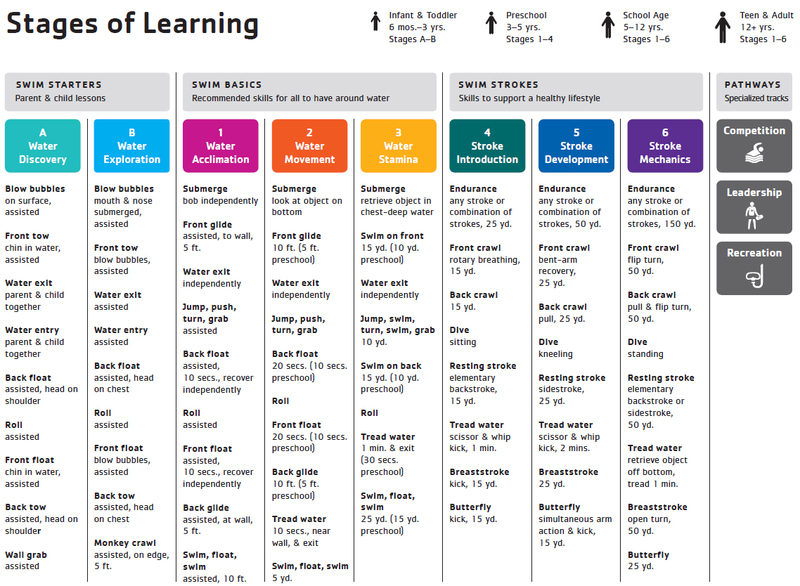 After establishing the foundational safety skills, swimmers can then be exposed to engaging water-based activities to increase their stamina. Swimming also allows for both beginner and competitive swimmers to strive for new goals, and learn how to constantly create and reach new, attainable goals, resulting in an increase in self-confidence. Based on recent scientific studies, swimming can have long lasting mental and physical benefits. These benefits extend to a wide variety of applications in and out of the pool environment, in some cases even leading to a career! WHY CHOOSE THE WEST COOK YMCA? Frequent, consistent communication regarding student progress. A continuous skill progression that allows for a wide variety of abilities and a smooth transition between levels. Engaging lessons that encourage goal orientation and cultivates high self-esteem. A fun learning atmosphere aimed at promoting a positive mental attitude. 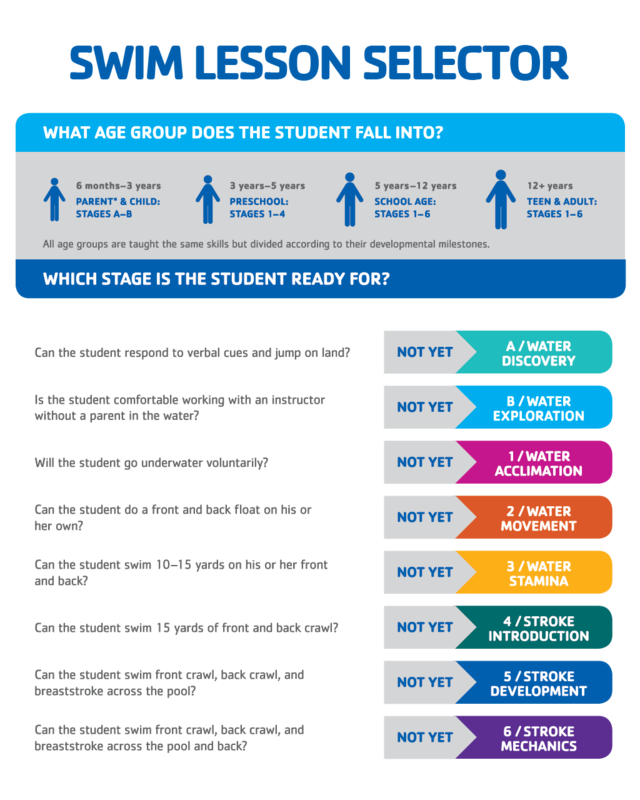 To help you better understand our skill-based continuum as well as to help you find the best fit for your swimmer, please refer to the following. Is your child ready for competitive swimming? Learn about our Competitive Swim Team. If your child is 16 years or older, we offer Red Cross Lifeguard Certification and First Aid/CPR/AED Certifications. Are you interested in having one on one instruction or have a friend you would like to learn to swim with? Do you need more flexibility in when your lessons are offered? If so, private lessons may be just for you. To sign up, obtain a private/semi-private lesson request form at Member Engagement Desk. Once completed, we will match you with a qualified instructor. Space is limited! Members can enjoy the benefits of private swim lessons offered by West Cook YMCA certified Swim Instructors. If you are a West Cook YMCA Member or have previously booked a private lesson, please book an appointment by calling Member Services at (708) 383-5200. 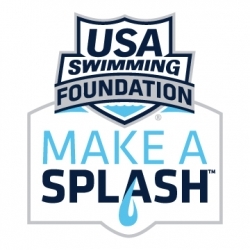 The West Cook YMCA is a proud recipient of the 2019 Make a Splash Grant from the USA Swimming Foundation. Learn more about the Make a Splash program here.